Len Saunders graduated from the University of Bridgeport in Connecticut, majoring in Physical Education. He later went on to receive a Master’s degree in Exercise Physiology from Montclair State University in New Jersey. Len is an award winning / best-selling author, motivational speaker in the fight against childhood obesity, and nationally recognized for his innovative wellness events. Recently, you may have seen Len on such media giants as CNN, Good Morning America, CNBC, The Today Show, ESPN, Nickelodeon, MSNBC, The Fox Channel, as well as the front page of The Wall Street Journal. MO: Where does your passion for eliminating childhood obesity come from? Len: As a child, I had many adult figures in my life who influenced me to be the very best I could be. Growing up without a Dad who had passed gave me a distinct disadvantage early in life, but many role models in my life helped guide me in the right direction. As I got older, I wanted to be able to do the same, and help young children anyway I could help them in a positive manner. MO: Why do you think that childhood obesity has become such an epidemic and what are some ways that our readers could address this issue at home? Len: Things are different now than 25 years ago. Many children do not walk to school anymore, there is 24/7 kids channels along with so many other forms of technology – which promotes sedentary lifestyle. In many homes, both parents work, and children are on their own, staying safely inside, as well as eating unhealthy snacks. Vending machines in schools with unhealthy choices are too convenient for children to make poor choices. MO: Can you tell us a bit about your innovative wellness events and what you’ve been doing to engage and motivate people into fitness? Len: For many people, especially children, exercise and proper diet is a challenge. In many cases, people want the positive results without putting in the quality time and investment into their health. Results do not happen overnight, and if someone works hard on healthy lifestyle, over time, positive results will occur. So, many of my wellness events are created to help ‘jumpstart’ someone into a new healthy lifestyle. MO: Can you talk about the inspiration behind and the process of creating Project ACES (All Children Exercise Simultaneously)? How have you managed to create an internationally recognized program that lhas millions of children from all 50 states and over 50 countries exercise in unison during the first Wednesday in May? Len: Children need motivational and novel ideas to exercise. You just can’t say to most children, “ok, give me 20 push-ups.” What is the fun in that when you are 7 or 8. Project ACES is a motivational tool designed to make exercise fun. Children love the concept of exercising with millions of children simultaneously from all over the world. This motivational tool is educational, fun, and novel – which is why it has been going on successfully over the last 25 years. MO: What were some of the highlights of your visit to the White House? Len: For me, when I was standing on the White House lawn, and President Bush came over to me and shook my hand. I was honored and so impressed. MO: What’s the most exciting thing on the horizon for you personally or professionally? 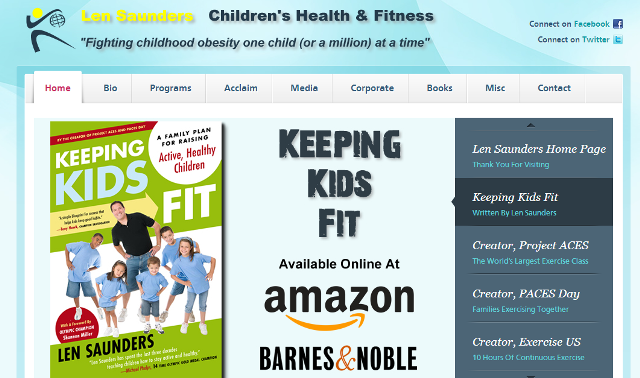 Len: For me, it is to continue to inspire children to lead healthy lifestyles. I also want to continue writing books geared to help people lead healthier lifestyles. I would also like to begin working with major corporations on various health initiatives – where we team up creatively and get the obesity numbers down all over the world.